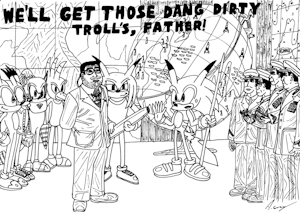 We'll get those dang dirty trolls, father! I'm more active on those two sites and occasionally post new artwork, photography, short stories, blogs and videos. Also, why is your username TheCrimsonEmo? I heard that you were a friend of sonictopfan, so, any one of his friends is my friend too. Have you heard of this game? https://www.youtube.com/watch?v=eSV0GO1Q3Co It seems similar to Minecraft, maybe it's your thing. Speaking of Minecraft, I watched this video about a week ago https://www.youtube.com/watch?v=F2wUy9w9pNY and I have to say the game doesn't look interesting at all, it's not my thing.